Brady Globalmark desktop label printer and the Brady Powermark desktop label printer, available from Jabac Connections , can make labels or signs on the spot for a user’s facility. 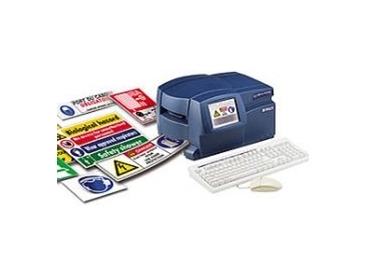 The users can create their own custom signs, labels, pipemarkers, tags with these easy to use, industrial label printers. With touch-screen technology, the Brady Globalmark desktop label printer and Brady Powermark desktop label printer can improve safety, enhance productivity, reduce costly errors, increase profitability and tighten security by simply touching and printing. The Brady PowerMark desktop label maker lets users to create industrial strength signs and labels up to 250mm high, in up to four colours with the use of multiple colour printing. The Brady Globalmark desktop label printer gives the choice of 15 tape materials including glow-in-the-dark, reflective and magnetic and is available in three different models that print in either one colour, multiple spot colours or blended colours, with one Brady Globalmark desktop label printer being able to cut out images and individual letters.